1. 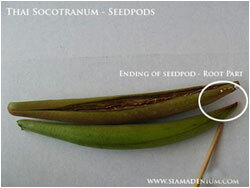 Prepare the healthy or strong scion from your variety selection. Make sure you see the many clear buds from that branch. 2. Find the healthy rootstock with any hybrids. 3. Make the V-Grafting on rootstock. 4. Cut the left side on center of rootstock. Cut the right side to make V-Cutting shape. 5. Now you will see the V-Shape on top of rootstock branch. 6. Do the same thing on scions, then that scion will look like V-Shape. 7. Put that V-Scion down to center of rootstock (V-Position). 8. Wrap that grafting area with grafted tape, not too tight. 9. Please make sure that you should try to wrap & cover that area with tape as much as you can to protect moisture and fungi disease around that grafting area. 10. Cover all of them with small plastic bag in order to protect vaporization and fungi disease from the air. 11. Waiting for a week then you will see new small born branch growing up from that bud position. 12. When you open the plastic bag, you will see clearer growing bud growing bigger and bigger. This is another technique called "Multi-V Grafting, this technique is great for multi-folower colors on single rootstock branch. 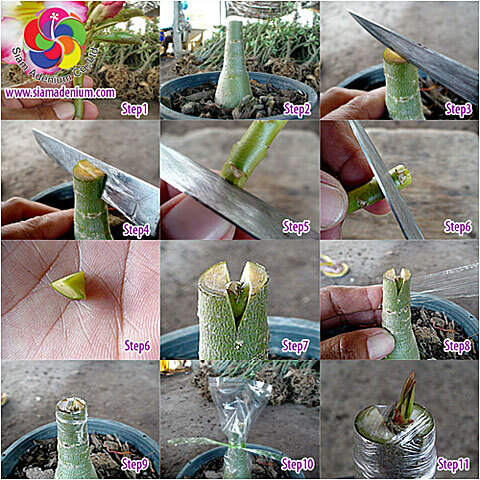 Actually, there are many propagation methods for Adenium like cutting, crossing, etc. This is only one way of propagations. Why do I enjoy growing Adenium much? The reason is Adenium is the plant that we can enjoy growing with every plant part in itself, not only flowers attraction but branches & caudex bonsai training and root organization. I hope you will like this plant same as me. Have a nice day. 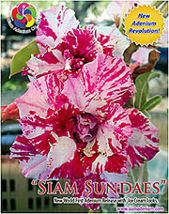 We also provide you with medium & large size Rootstock grafting on your own flower selections. Please just follow this link.